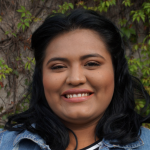 Carmen is originally from Iztapa, Escuintla and was selected as a GOJoven Fellow when she was 22 years old. She is a teacher of Intercultural Infant Education and also studies at the University of San de Guatemala. She is in her 5th semester of studies in education. Carmen has experience as a teacher and works with girls, and young people on the subjects of self-esteem, leadership, human rights and civic participation. Carmen’s goal is to build a space for discussion with all girls about sexual rights as human rights, in order to eradicate sexual and intra-familial violence. Post-GOJoven fellowship, she is committed to replicating what she has learned and informing others in the community.